Regarded by jewellery aficionados as one of the most iconic pieces ever designed, the Love bracelet by Cartier has certainly come a long way since its inception in 1969. 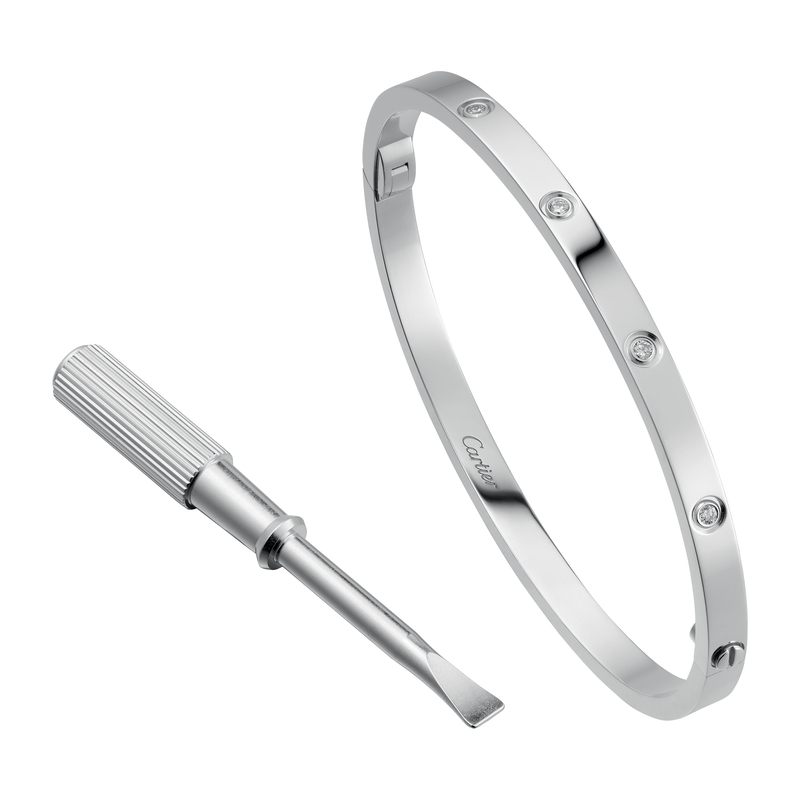 Created by Aldo Cipullo, the bangle’s unique charm lies in its locking mechanism that involves concealed screws tightened using the pocket-sized screwdriver which accompanies every bracelet. Available with or without diamonds, this symbol of inseparable love comes comes in three alloys of gold. Here’s one way to tell someone that you’ll love them to the moon and back. Designed by Creative Director of Dior Joaillerie Victoire de Castellane, the Rose Céleste collection pays homage to the legendary couturier’s passion for the divinatory arts and astrology. Available as a bracelet or necklace, each piece features a medallion displaying a mother-of-pearl moon with three small white gold stars embedded in an onyx disc; while the reverse showcases a majestic yellow gold sun set against a iridescent mother-of-pearl background. This unique union between the Maison’s emblematic Happy Hearts jewellery collection and the Happy Sport watch range presents a playful reminder to ensure that one always has time to spare when it comes to matters of the heart. 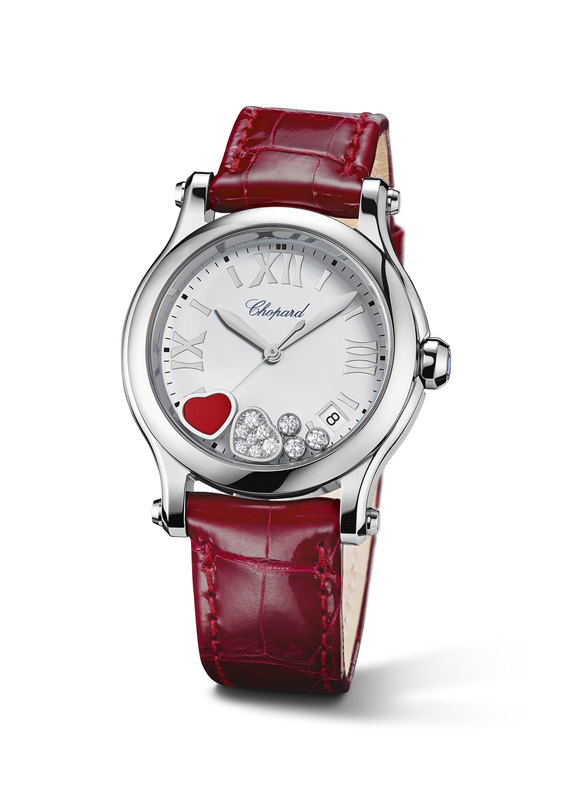 Presented in a 36mm stainless steel case paired with a luxurious red alligator strap, a closer look at the white dial of this iconic timepiece reveals a bedazzling display comprising three freely dancing diamonds, a red heart as well as a diamond-set heart sparkle to life with every flick of the wrist. If refined elegance is a promise of eternity, then this delightfully petite timekeeping wonder certainly fulfils that promise. Fitted with a self-winding mechanical movement, the watch is immediately distinguishable by its feminine 18K red gold case set with 68 diamonds which plays on the sensual hourglass figure that resembles the number 8. 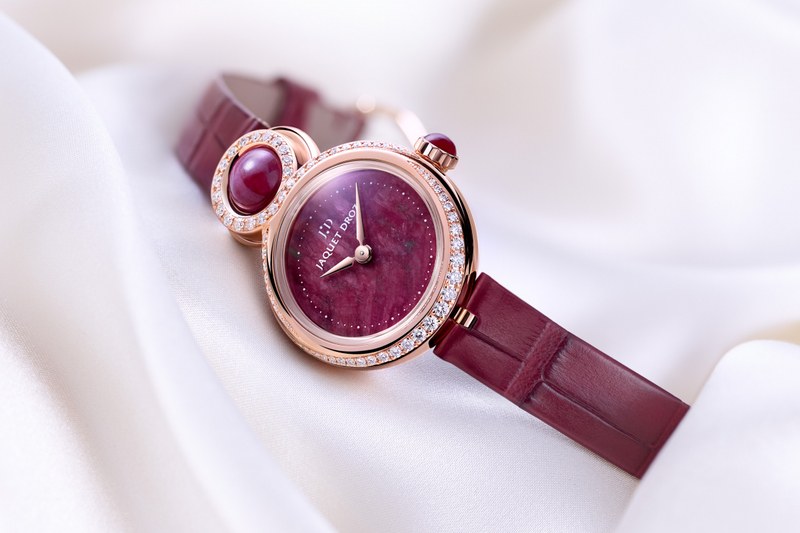 Additional elegant traits worth mentioning include the spherical bead placed at 12 o’clock that rolls smoothly under the finger which perfectly matches with the ruby heart dial, crown cabochon and strap in burgundy alligator leather. For those who prefer to always wear their heart on their sleeve, this latest gem from the American jeweller will immediately captivate which its romantic visage. Housed in a stylish rectangular case in 18K white gold that has been cambered to ensure a perfect fit on the wrist are while 48 radiant white brilliant-cut diamonds on the bezel, lugs and sides of the case punctuated by a mesmerising heart-shaped ruby sits in the top arch at 12 o’clock. 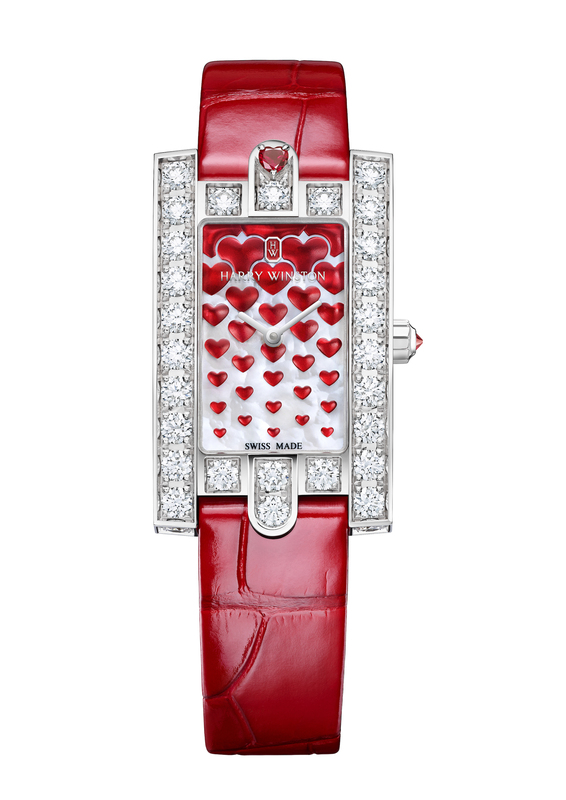 Limited to just 14 pieces, each stunning timepiece comes presented in a beautiful white box decorated with precious red hearts which perfectly match with the vivid red mother-of-pearl hearts displayed on the dial.